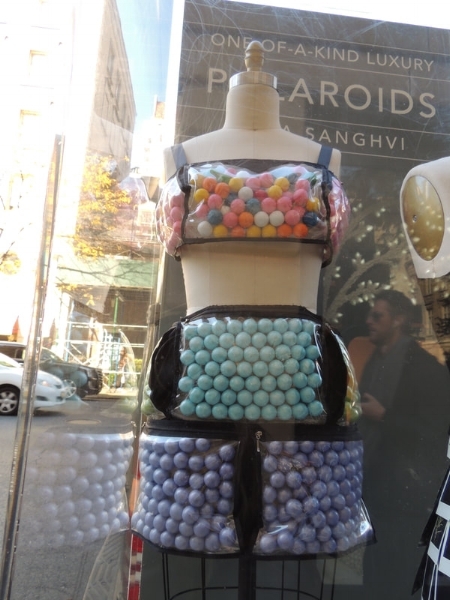 From 61st Street to 76th Street on Madison Avenue, I was witness to a fashion lover’s dream come true: an outdoor exhibition of innovative outfits that would seem impossible to achieve--except that I have the pictures to prove it! They were all created out of what what one would call “unconventional materials.” Similar to the challenges that Project Runway tasks its designers with, BFA students from the School of Visual Arts were asked to create 14 three- dimensional high fashion looks out of anything but fabric in a mere two weeks. I loved seeing what the young designers came up with, and I had fun playing judge (eat your heart out, Heidi Klum)! The avant-garde designs were works of art that turned the streets of New York City into a museum with no admission fee. I spent an hour walking in the cold so I could enjoy the fashion and photograph the looks--here are the designs, in order of my favorites (note: the installations were removed on November 15th). 1. The Pencil Shoes: This was my favorite design out of all of the ones I saw--a work of pure genius. The creativity factor was through the roof, as Zhuoyuan Li used 288 pencils (enough to write 12.9 million words!) to create the ultimate pair of stiletto heels. The icing on the cake was the lining of the pump, completely covered in erasers. 2. The Silverware Flapper Dress: Oh, if only we could travel back to the 1920s, everyone would be dying to wear Filipa Mota’s design. 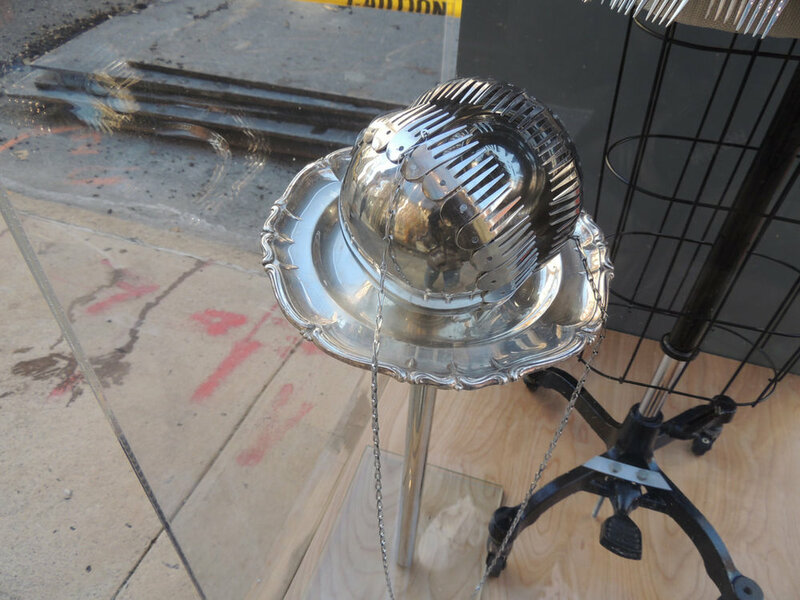 This showstopper was made out of silverware, approximately enough for 491 people to dine! Mota paid close attention to the details of her look, masterfully executing a circular “fork purse” and “spoon locket necklace” to add to her ensemble--not to mention a bustier made from a pair of serving ladels! 3. The Tea Bag Raincoat: Chris Choe managed to take inexpensive tea bags and turn them into a posh piece of fashion. Even though this raincoat could fill 1,400 cups of tea in the rain, I could definitely see it on couture runways. 4. The Packing Peanut Pajamas: This risky twist on sleepwear created by Gabriela Ong really paid off. Using 1,569 white packing peanuts and 50 pink packing peanuts (1.5 cubic feet of packing material! ), she created a masterpiece that was perfectly arranged and looked completely cozy. 5. The Keyboard Tuxedo: Since it was one of the only looks with an androgynous twist, I was immediately interested in finding out more about it. Upon closer inspection, I was astonished by the fact that black and white keys were craftily placed to create the look of a tuxedo jacket ensemble. Even the bow tie was made out of keys! 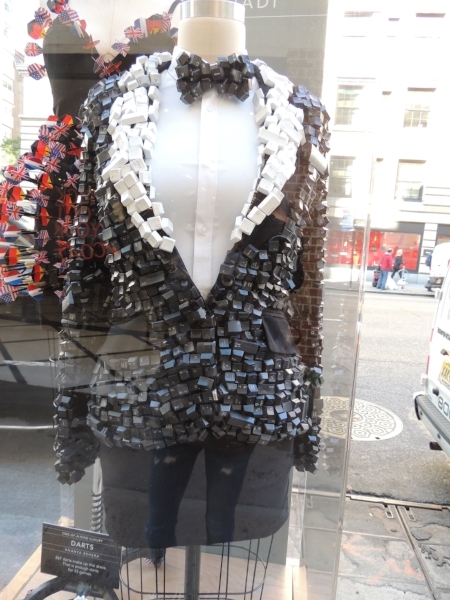 Another plus: 45 recycled keyboards were used for the suit jacket. Truly a work of brilliance by Cindy Setiadi. 6. The Penny Mini Dress: This piece was made out of 42.9 lbs of pennies, enough to make 12,500 wishes in a fountain. Mert Avadya did a fantastic job of punching holes in each penny in order to thread them them together with coils. Priceless high fashion. 7. The Wheat Suit: Inspired by Van Gogh, Jacob Cotov used over 900 wheat stalks to create a high-collared shirt and pants ensemble. Although I felt the wheat could have been manipulated more in the pants, the shirt made up for it with its intricate swirls. The wheat woven together looked like a mosaic that could hang in a prestigious museum. 8. The Tree Bark Gown: Bobby Cao’s dress really resonated with me; the simplicity of its beige color could have been boring, but the innovative bodice elevated it. The way that Cao placed the bark in varying directions shows the work of a true artist. He was not afraid to use a difficult material to sculpt his design...and a whole lot of it (4.5 running yards of bark)! 9. The Telephone Glasses: Michele Clark took a risk by only choosing to create an accessory. However, her creativity in manipulating an old-school telephone is commendable. To create her specs, she used one phone receiver, an earpiece, two phone cords, and 24 number keys. I especially loved how she used a cord to replicate a nosepiece and designed a choker out of keys to go with the glasses. 10. 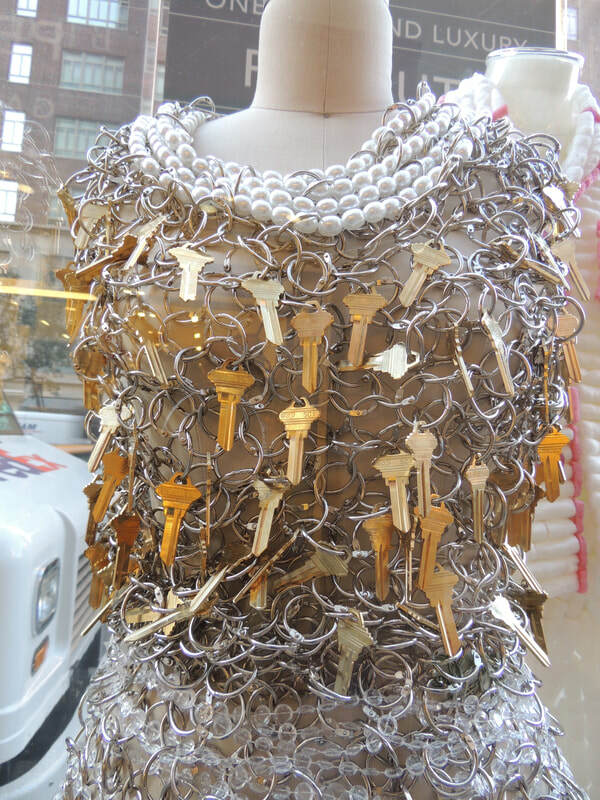 The Keychain Dress: Although Tae Gyung Kang’s mix of silver and gold was beautiful, I wish that the designer would have made the look on the mannequin more wearable. Glancing at the outfit, it’s hard to picture a real person being able to pull it off without an undergarment to cover strategic places. However, I appreciate the touch of pearls she added to the neckline, as well as the hard work she put into it (she used 1,800 keychains and 98 keys!). 11. The Shoelace Sneakers: I was impressed by how Nakyung Youn wove a shoe solely out of 55 shoelaces, creating a unique textile. Youn did a fine job linking the laces together, but I wish that the work would have been a bit cleaner--there were a few gaps and holes which I wasn’t sure were intentional. If there was more time to work on this project, I’m sure that the shoes would have been extraordinary, since the innovation was clearly there. 12. The Slinky Gown: Olivia Wilson did not shy away from creating an avant-garde design...made out of 109 Slinkies! There were many aspects of the design that I loved, from the variation of Slinky colors, to the shape of the low v-neck, to the Slinky cuffs on the shirt’s sleeves. However, I noticed that she used black fabric to hold her look together, which is unfortunate since it downplayed the unconventional element. 14. The Can Dress: Although using 187 food cans (enough preserved goods to feed one person for six months!) was a very creative idea, I wish that Michelle Clark would have put a little more thought into making her design. The bodice did not seem very wearable, and I would have liked to see more variety of color in look altogether. Perhaps if she spray painted some of cans, the design would have come to life. 15. The Computer Armor: Although I appreciate James Tsang’s hard work in creating a suit of armor out of 225 Ram Chips (equivalent to 75 computers), his look was not my favorite—it felt a bit costumey. Again, I would have appreciated something more wearable. 16. 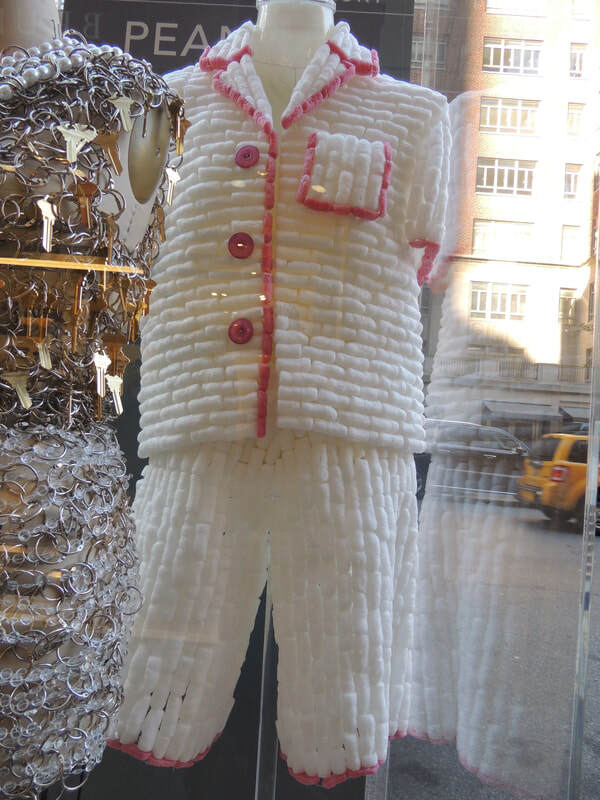 The Earplugs Dress: I could tell that Julian Fama’s dress, made out of 2,538 foam earplugs, took a lot of work to create. But I wish he would have used a variety of colors instead of one vibrant peach hue. Also, if you look closely, you see that there is green fabric peeking through the earplugs. I wish he manipulated the earplugs on the mannequin instead of on top of a conventional material. 17. The Two-Piece Gumball Set: The 518 gumballs in Yicen Hou’s look were playful and vibrant, but there was little manipulation of his unconventional materials. The gumballs were simply stuffed into plastic pouches. My suggestion would have been to smash the gumballs for a more interesting design. If only, if only. 18. The Polaroid Dress: This dress does look wearable, but that’s probably because the majority of the design is fashioned out of black fabric. Isha Sanghvi’s 175 polaroids of flowers created a beautiful collage effect on the skirt, but they were just placed on there, not cut or transformed. Also, the polaroid necklace did not do the design justice--it looked clunky and unnecessary. 19. The Monopoly Suit: Matt Iacovelli’s suit--made out of 13 game pieces and 41 houses and hotels--had the potential to be a showstopper. But I was extremely underwhelmed by the lack of unconventional material. The game pieces were placed on the button down shirt underneath, which you could hardly see. The look was also mostly painted fabric, and when you did see a Monopoly house, it was simply glued on, not transformed. At least the silver game pieces as cufflinks were a clever touch. 20. The Darts Dress: The dress--made by Anaya Behera--was made out of 267 darts, enough for 33 games! However, it did not look like much effort was put into creating the design. Although the use of color was refreshing, the darts looked simply stuck on a little black dress; the creativity was lacking. 21. The Paint Dress (? ): Notice the question mark...it’s because I’m not quite sure what this design is. It kind of looks like a cool sculpting of Elmer’s glue...except this is a fashion design challenge. 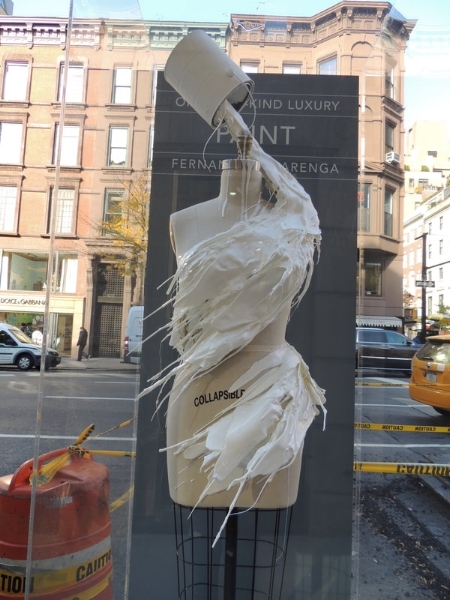 If you took away the mannequin and just held up the outfit, I’m not sure that anyone would be able to recognize Fernando Alvarenga’s four gallons of smooth cast as as a mini dress. My overall verdict: Each Individual design had something unique and expressive about it that made onlookers--including myself--stop and stare (there were no real bad looks!). I tried to give my honest opinion on each, and I hope you enjoy the photos I snapped, as these designs are some of the most innovative that I have ever seen. I commend the SVA students for daring to be bold with no regrets.